You are American-born and all career paths are open to you. If you don't see the job you want, create one. Editor's note: The following column was submitted to The Spokesman's sister publication, The Portland Tribune. We are reprinting the column because we believe it will resonate with many immigrant families in our communities. Your mom and I don't remember when our first days of school were back in Bhutan, but even though our moms (your grandmas) weren't able to take our pictures, they understood the value of education. Your grandparents were never given an opportunity to attend school for even a single day because there was too much work to do in the house, in the field or taking care of the cattle. They couldn't go to school themselves, so they worked very hard to make sure that your mom and I could, even in the refugee camps in Nepal. Today, one of your grandmas (your daddy's mom) is here to send you to school, and she is so proud and happy for you! She can't stop smiling as she applies tika (red mark) on your forehead and speaks a blessing for you. We can't believe you are starting your life's educational journey today! We are so excited for you. And so incredibly proud. You have so much potential, and you can discover your aspirations and accomplish them. We have confidence that a lack of education will never hold you back and that you will never be shut out of your dreams because you didn't qualify. Your school teacher is an African-American woman with 29 years of teaching experience and you are bilingual. What a great combination. We are very sure there are kids being raised today in the image of the 45th U.S. president who will not understand or accept (and maybe even hate) refugees and immigrants. Remember this always: Your parents came to the United States as refugees and someone advocated for us. Because of that, your mom and I advocate for others as they arrive. We hope you will join us in fighting the good fight to welcome and be more compassionate to new Americans. We know the problem of over 100 million displaced, stateless and refugees won't be solved in your time, but we are counting on your generation to try. Your mom is a Hindu and a Democrat, and your dad is a believer of all religions and an Independent. We don't know which religious practice or party affiliation you will choose. Whatever your choice, please support paid leave, health care, accessible education, minimum wage, equity, transparency and efforts to combat climate change. We know you are caring already. We can see it when you ask us, "ke va?" (what happened?) when we are silent or surprised. One night when Daddy didn't come home until late, you called and left this message in English and Nepali: "Baba, I love you, too! Love you! E cha. Do you want to eat rice? Do you want to eat noodles? Did you take a shower yesterday? I am good." When we hear your concern about whether we are taking care of ourselves, your compassionate nature shines through. This is a great strength. In the course of your life, you may hear someone say, "Refugees and immigrants, like your parents, steal American jobs." We want you to know that isn't true. Your mom and I have done many labor-intensive jobs that Americans who were born here didn't want to do, or even talk about. You are American-born and all career paths are open to you. If you don't see the job you want, create one. Anyone would be lucky to work alongside a strong, caring individual such as you. Our daughter, you are a limitless possibility. Happy first day of preschool, Santi! We love you very much. Pampha and Som Subedi are from Bhutan. 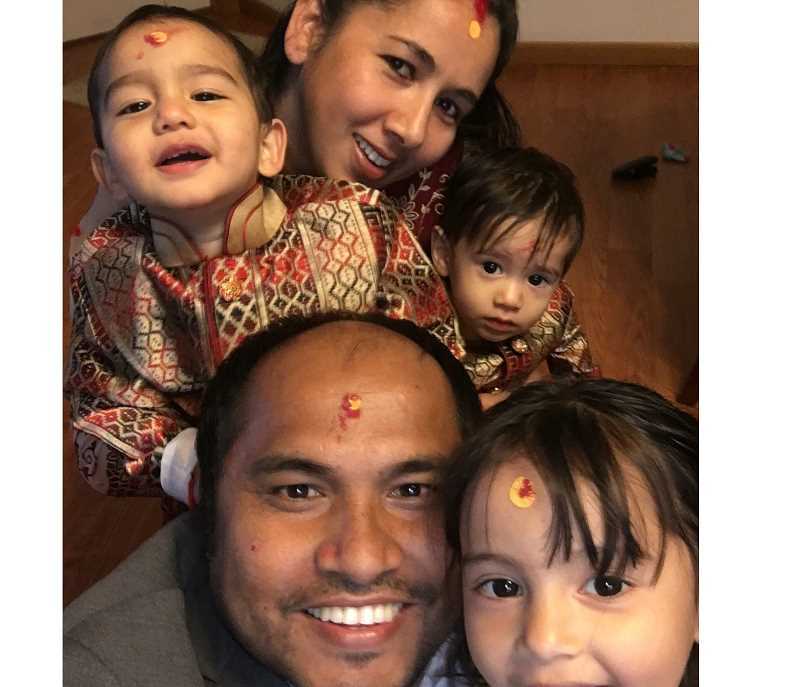 They immigrated to the United States in 2008 and 2009 after spending almost 20 years in refugee camps in Nepal. They now live in Portland with their 3-year-old daughter, Santi, and twin 16-month-old sons.